LAW OFFICES OF RICHARD PENA | AUSTIN TX | WORKERS COMP | PERSONAL INJURY | NEWS - Law offices of Richard Pena P.C. Richard Pena recently was selected to meet with a group of delegate lawyers visiting from Uzbekistan. They were in Austin to learn more about the Texas Judicial system as they are currently reforming their own Judicial system in Uzbekistan. The exchange between lawyers was important and necessary the State Bar of Texas as it showed how countries can come together to bring progress to e world. This award was presented to Richard Pena at the 15th Annual Austin Bar Foundation Gala. The award is given to honor a firm or an individual who has led the way in bringing diversity to Austin’s legal community. Past President of the State Bar of Texas, Attorney Richard Pena, has been appointed as the Chair of the ABA Commission on Hispanic Legal Rights & Responsibilities for the 2017-18 bar year by ABA President Hillarie Bass. Brad McClellan, Attorney with the Law Offices of Richard Pena, was recently interviewed by the Austin American Statesman and the Texas Tribune for the article "Insuring Success" and accompanying video "Paid to Prosecute." Both cover some of the questionable business practices of Texas Mutual Insurance Company. Brad McClellan offers insight into the issues raised and workers' compensation. Richard pena appointed to two new positions! Richard Pena has recently been appointed to the Pro Bono and Public Service Committee of the ABA, solo, small firm, and General Practice division as well as reappointed as a commissioner to the Commission on Hispanic Legal Rights & Responsibilities of the ABA! Attorney, brad Mcclellan: Board Certified Workers' Compensation Lawyer. Our very own attorney, Brad McClellan has recently been board certified in Workers' Compensation Law from the Texas Board of Legal Specialization. To find out more about Brad click HERE! The State Bar of Texas’ Workers’ Compensation Section recently presented Richard Pena with the Distinguished Member of the Bar Award. The presentation was made at the Advanced Workers’ Compensation 2014 Course in Austin, Texas, and is referred to as the Barb Wire Award. It is the first time the Section has presented such an award. Richard is back from Ireland! Richard left for Ireland on May 14, 2015 as part of a legal delegation. 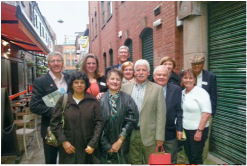 While there, the delegation met with lawyers to learn about the Northern Ireland Peace Process. Their overall goal was to have the political and historical situation of Ireland put into context. Check out the Legal Delegations Abroad blog for up to date information about upcoming trips as well as look at past delegations! To see some pictures click here! It has been in the making for over 3 years now but Richard Pena's first book is available for purchase through Amazon in both a paperback and e-book format. To find out more about the book click HERE! LAST PLANE OUT OF SAIGON is a faithful reproduction of the journal Richard kept in the operating room of Vietnam's largest military hospital during the final year of the war. Supporting historical and political context is provided by award-winning scholar, John Hagan. Richard’s entries were written in real time and, as they chronicle the last desperate year of this tragic war, present readers with a better understanding of the complicated final year of the Vietnam War from the inside, looking out. A year that tragically remains unfamiliar to most Americans. This landmark book describes, in part, the hasty departure of American troops from Vietnam but is timely now as America again withdraws from war. It is a gripping real-time account of the anger, resistance and resilience forged in one man by the horrors of Vietnam witnessed up close, in graphically human terms, touching on mistakes that were made then and which our country continues to make today. The reader will feel the weight of this compelling account, as the Vietnam War continues to plague the consciousness of our country. All Americans should read this important piece of history, bound to leave them with chills. Richard Pena featured in Texas Bar Journal! President and CEO, Richard Pena is featured in the February 2014 issue of the Texas Bar Journal along with other trailblazers in the practice of Law! Richard was selected as 1 of 20 members to be featured in this article that marks the 75th anniversary of the State Bar of Texas! In celebration of the 75th year of the State Bar of Texas, this article was meant to highlight and honor these 20 individuals. This is just one of the testaments to Mr. Pena's hard work and influence in the field of law! He is a dedicated and hardworking attorney that not only actively practices but is also active in several organizations such as, People to People Ambassadors Program, Legal Delegations Abroad, American Bar Foundation and many more! Attorney, Brad Mcclellan's Recent Win! Several days ago, Brad McClellan won a jury trial. It was a Workers’ Compensation case which involved whether the deceased was in the course and scope of his employment as a courier for LabCorp while traveling from his home to his first stop. Brad represented the minor daughter beneficiary. The trial was in the 429th District Court in Rockwall, Texas, and after only 20 minutes of deliberation, the jury delivered its verdict in favor of the beneficiaries. To find out more about Brad click HERE or view him in this Supreme Court video! Read Mr. Pena's Article, "GIVING BACK: Lawyers Under Attack in Turkey", published in the American Bar Association's publications, GPSOLO as well as The Texas Bar Blog! Click HERE for that article! Richard Pena will leading a delegation to India November 9-17! To find out more about this trip and other delegations click HERE.